Say ‘Brooklyn’, and several images spring forth – it is the cool epicentre of craft beer, hipster bands, elaborate facial hair and vernacular graphics, isn’t it? What does not immediately come to mind is a football magazine. This is hardly a surprise – with football (aka soccer) a global business – but Brooklyn seems an unusual base for a seriously beautiful quarterly magazine about the sport. Until you dig a little deeper; there is an Englishman at the helm, in the shape of legendary designer Robert Priest. So, with a World Cup (to be played this year in Russia) around the corner, and the latest issue of Priest’s magazine, Eight by Eight, about to hit the streets, it is time to explore the unique editorial world of ‘the magazine the beautiful game deserves’. 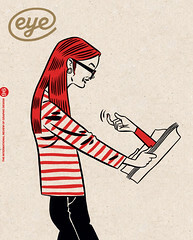 Cover of Eight by Eight no. 13, Summer 2018. 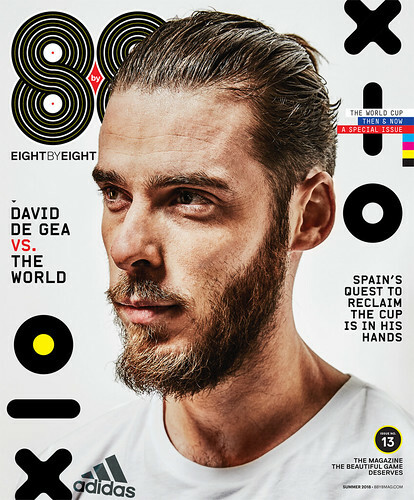 David De Gea is a fitting cover star for the World Cup issue, and the knowing ‘beautiful game’ tagline demonstrates that this is a title for true aficionados. Top. Spread from no. 12, Winter 2017. Roger Neve shot cover star Gianluigi Buffon, the Juventus and Italy goalkeeper, in a shoot ‘inspired by the 1960s films of Federico Fellini’.